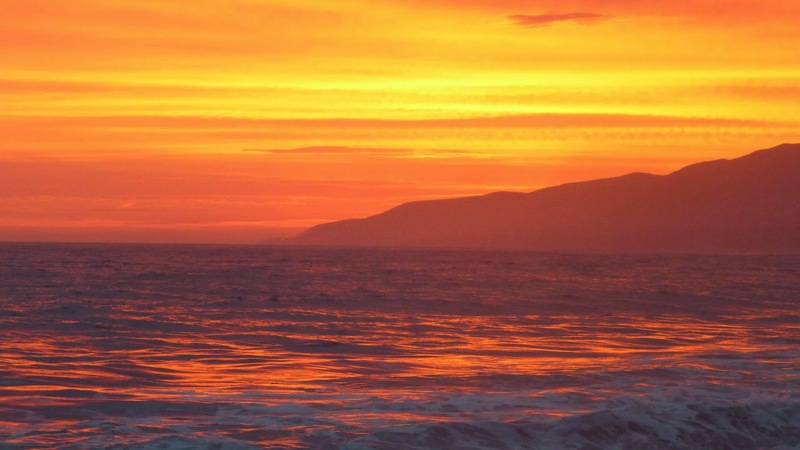 A December sunset transforms water and air to fire and gold at Malibu's Westward Beach. 2014 was an amazing year for sunsets. All Photos © 2014 Suzanne Guldimann. All rights reserved. 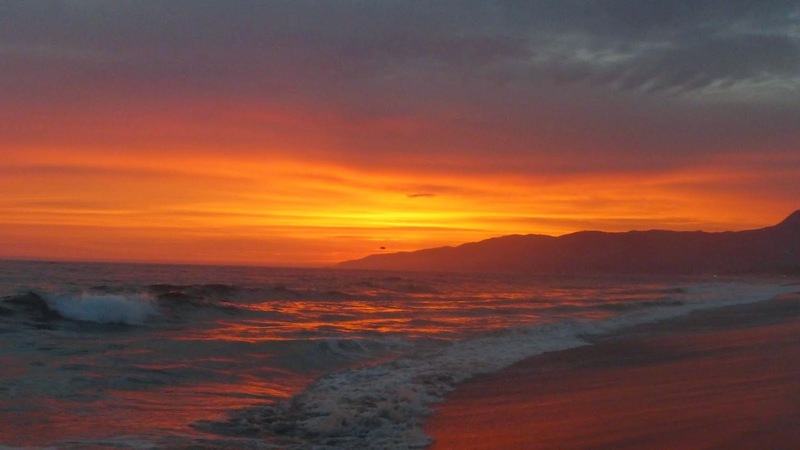 Albuquerque explained that she views Malibu as a sort of natural solar and lunar observatory, enabling the observer to track the path of the sun and moon across the sky throughout the course of the year. 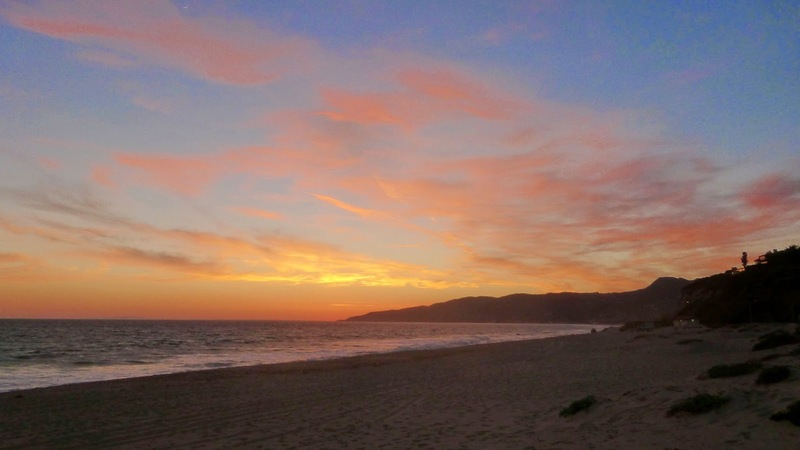 She suggested that Malibu residents who spend time outside observing nature develop an almost instinctive understanding of the annual path of the sun and moon across the summer and winter skies. 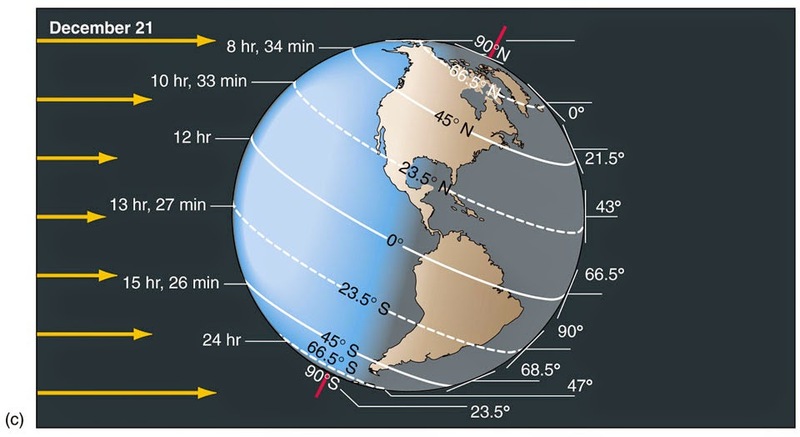 This NOAA graphic illustrates the angle of earth at the time of the winter solstice. It's certainly true that the Chumash, Malibu's first residents, had a sophisticated knowledge of astronomy and the annual solar cycle. For the Chumash, as with so many other cultures around the world, the winter solstice, the shortest day of the year and the turning point when the days begin once again to lengthen, was an important occasion. Ethnographic records indicate that the moment of the solstice was observed with the aid of a carefully prepared wooden pole that was used as a solar observatory. The arrival of the moment of the solstice was accompanied by ceremony. The solstices and the equinoxes are still observed each year at the Wishtoyo Chumash demonstration village at Nicholas Beach—the ceremony reconstructed by contemporary Chumash elders and led each year by Chumash activist Mati Waiya. The event's organizers didn't respond to this reporter's request to cover the ceremony this year. However, the Malibu Times was invited and has good coverage of the event. The website solarplots.info features this graphic representation of the angle of the winter sun. 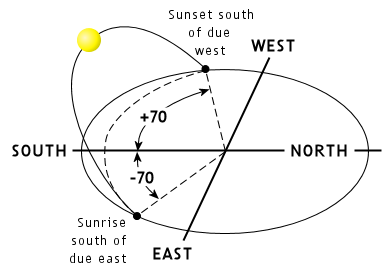 It's easy to forget just how far the sun "travels" away from due west and due east during the year. 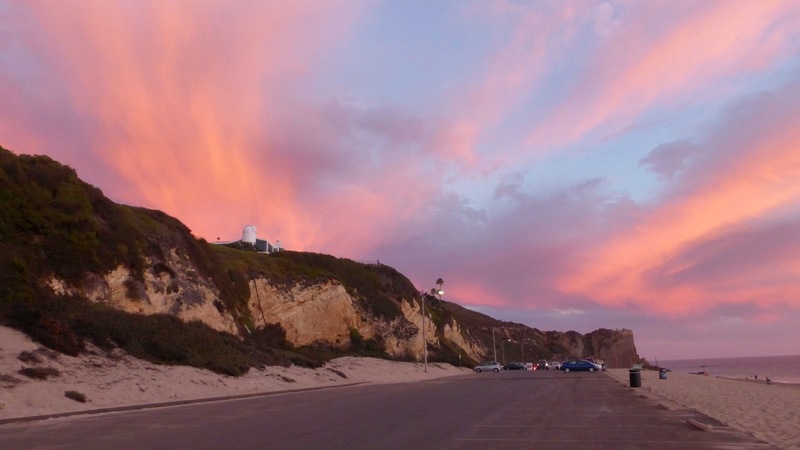 There is evidence that Point Dume, which faces due south, was once an important Chumash shrine site. Today, it is still a fine place to mark the solstice and to track the path of the sun across the sky throughout the year. On the winter solstice—3:03 p.m. on December 21 this year, the sun reached its most southerly declination, which means that the North Pole is angled away from the sun to the farthest extent possible, -23.5 degrees. For the Malibu observer, the sun at midwinter appears to rise south of due north—over Palos Verdes, instead of Los Angeles, and sets south of due west, over the open ocean. Although there is the potential for spectacular sunsets throughout the year, winter skies are often the most beautiful. The fact that the mountains aren't in the way as they are in summer when the sun sets farther north, is a contributing factor, so is the low angle of the sun, but the most important ingredient for a good sunset is clouds. There has to be enough cloud cover to catch the sun but not so much that the clouds swallow the light. Sometimes weeks or even months go by without the slightest glimmer of celestial fire. May gray and June gloom are not conducive to sunsets: when there's too much cloud cover the day simply fades into darkness. But at any time of the year, when conditions are right, the sky is transformed into flame and glory. This year seems to have have provided a surprising number of spectacular sunsets, or maybe I was just fortunate to be in the right place to see them. At any rate, as the sun sets on 2014, here's a look at the past 12 months of sunsets. Wet sand is transformed into a mirror that reflects the mother-of-pearl colors of the sky at Zuma Beach. January 2014 brought some of the most spectacular sunsets I've ever seen. It was hard to select just one image, but this one seemed to best capture the etherial beauty. The setting sun breaks through the clouds of a February storm, turning the sea to liquid gold and revealing the Channel Islands, a mysterious vision that evokes the myth of Bali Hai or the Garden of the Hesperides far in the west, where the golden apples of the sun grow, nurtured by the daughters of night. The aftermath of a March storm brings powerful surf and a sunset the color known as ashes-of-roses. By early April, the sun has moved halfway to the mountains in the north. 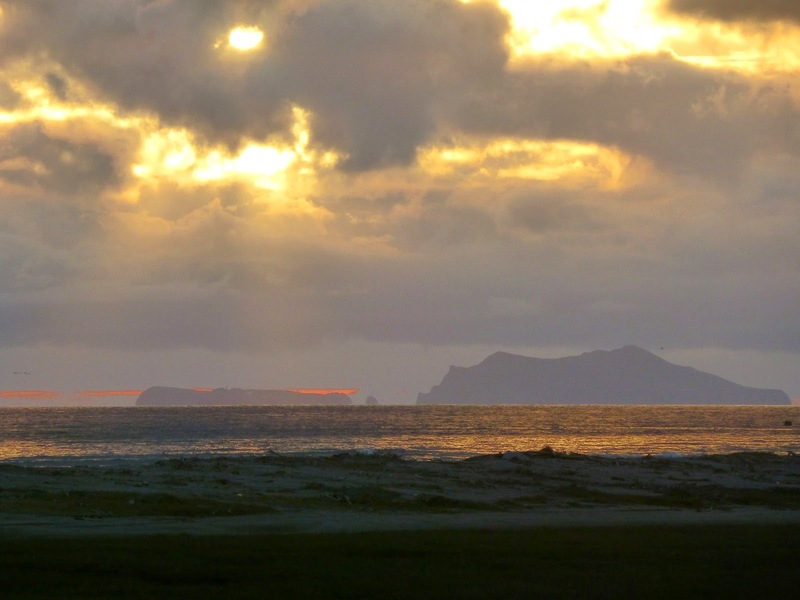 In May, as we approach the summer solstice, the sky watcher at Westward Beach sees the sun set behind the mountains. 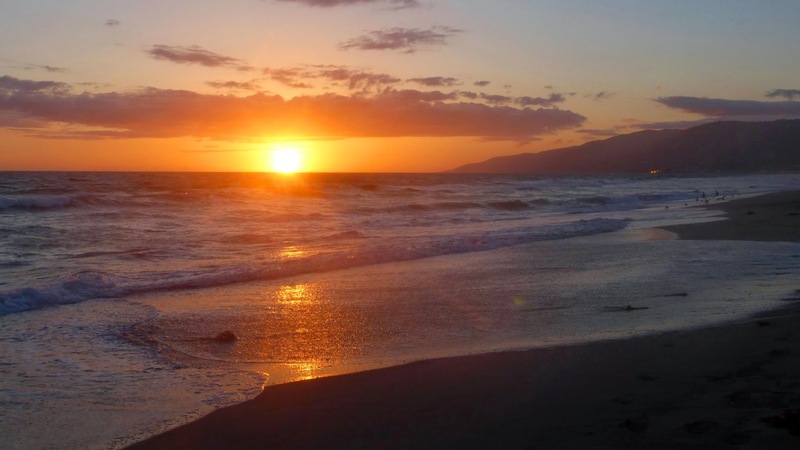 The Summer solstice—the longest day of the year—occurs around June 21, but its rare to see a good sunset during what is often Malibu's grayest month. 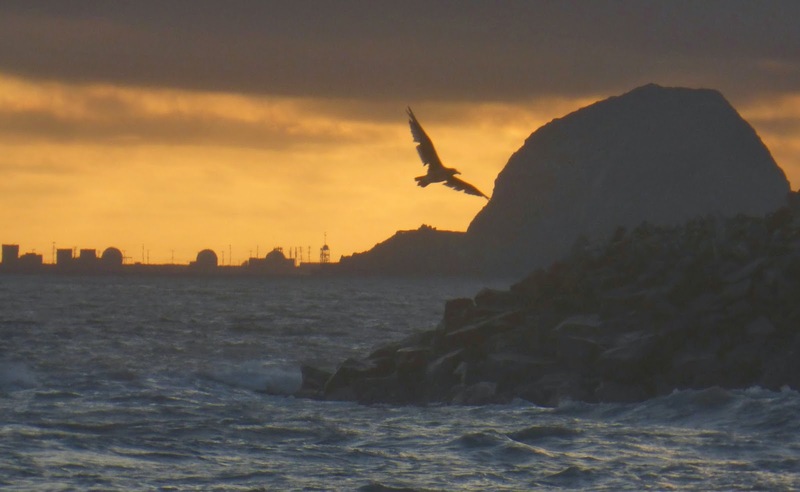 I photographed this sunset on July 7 at Sycamore Cove, looking towards Point Mugu. It seems to exemplify the quality of the light we experience in June, when the sun may only appear for a few minutes in the afternoon. A Mexican monsoon brings brilliant colors to this late July sunset at Westward Beach. Although the summer is only half over, the sun has already begun to move back towards the south. We had a whole succession of unusually spectacular skies this summer, thanks to a series of powerful Mexican storms that also brought big surf to the Southern California coast. 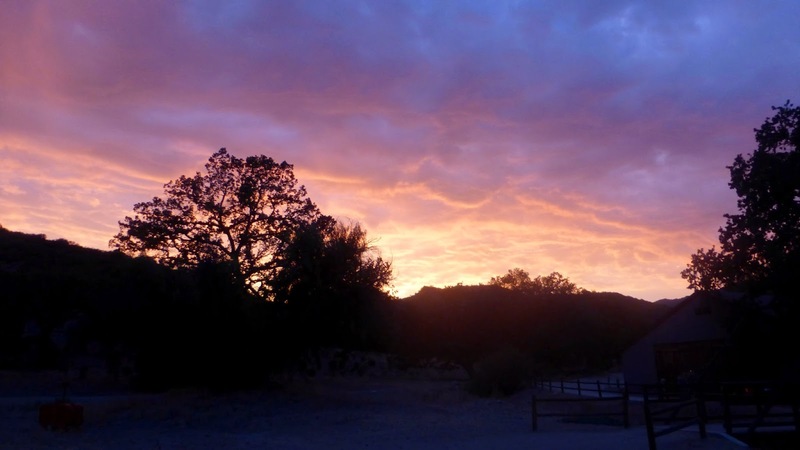 This was a surprisingly rainy and humid August sunset at Paramount Ranch in the Santa Monica Mountains. Here's another August sunset. If you compare the location of the sun in this photo with the April sunset photo, you can see exactly how far the sun has "moved" to the north during the course of the summer. 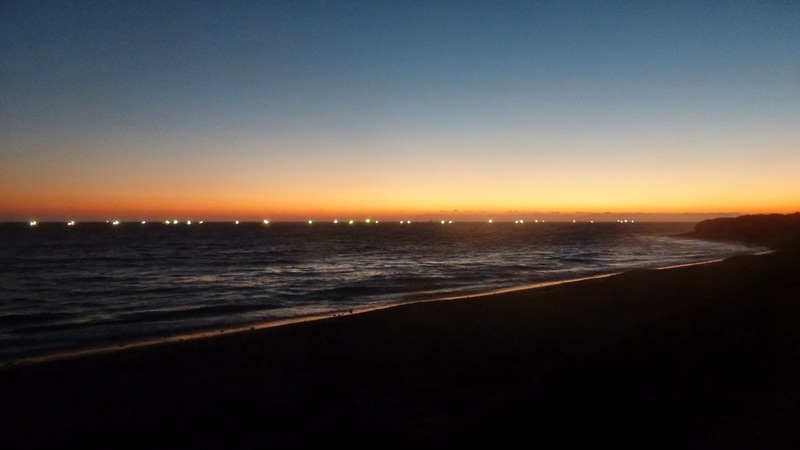 September's sunsets often include the eerie lights of the squid boats off shore. This is the scene from County Line on a cloudless September evening. 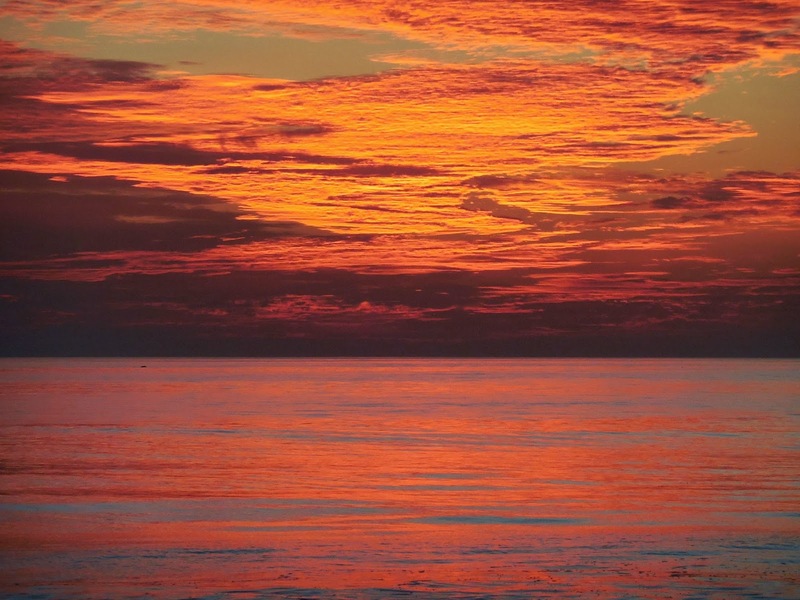 Depending on where the clouds are, sometimes the sunset colors appear in the east rather than the west. This strange and enchanting October sunset at Westward Beach occurred the evening before Halloween. The mysterious white dome on the top of the cliff is an amazing private observatory that is part of a Cliffside Drive house. We had Westward Beach to ourselves for this windswept, opal-colored November sunset. 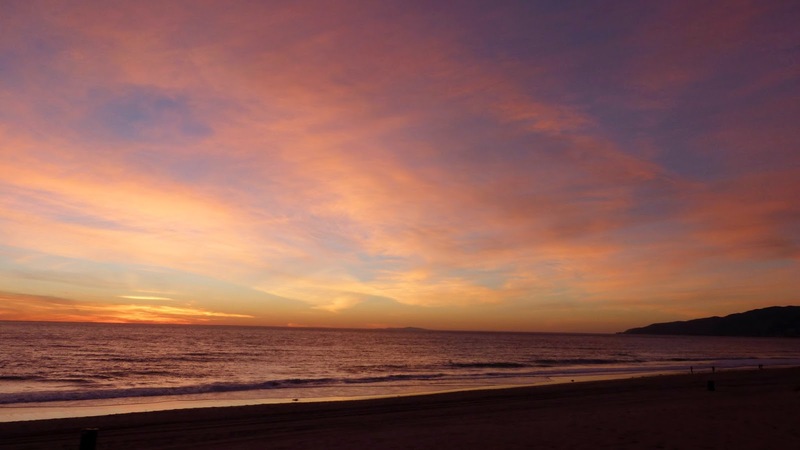 December again, and a sunset on the beach at Ventura that evokes Homer's "wind-dark sea." The secret to catching a good sunset is simple: you have to make the time to go out and look for it. Any westward-facing location with an unobstructed view will do, but whenever conditions look promising, we try to head for the beach. Zuma or Westward are marvelous places to watch the sun set. 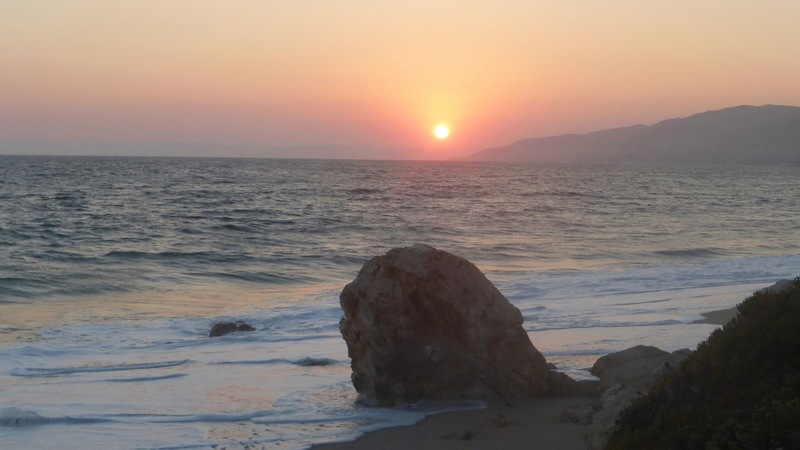 Other good local public sunset viewing places in Malibu are Bluffs Park, Nicholas and County Line beaches, Leo Carrillo's North Beach, and Point Mugu. Here at the Malibu Post we find its always worth the effort. Even if the sunset doesn't materialize, it's an opportunity to look at the sky and the ocean, listen to the waves, and to breathe. Sometimes we see dolphins or whales or sea lions. It's always a time for meditation and reflection, and sometimes we are rewarded with dazzling colors that grow more and more intense until they fade into darkness. Whatever 2015 brings for you, dear reader, I hope it includes time to watch for sunsets.